It’s very rare to find a royal love story but Marguerite of France’s marriage fits the bill. Even though there was over forty years difference in age between Marguerite and her husband King Edward I, they managed to find domestic bliss. Edward’s beloved first wife, Eleanor of Castile died in 1290 after a long illness, most likely malaria. Although Edward was filled with grief upon her death, he found it politically expedient to arrange another marriage, not only for himself but for his young son, Edward of Caernarfon, Prince of Wales. However, nothing was negotiated until nine years later. 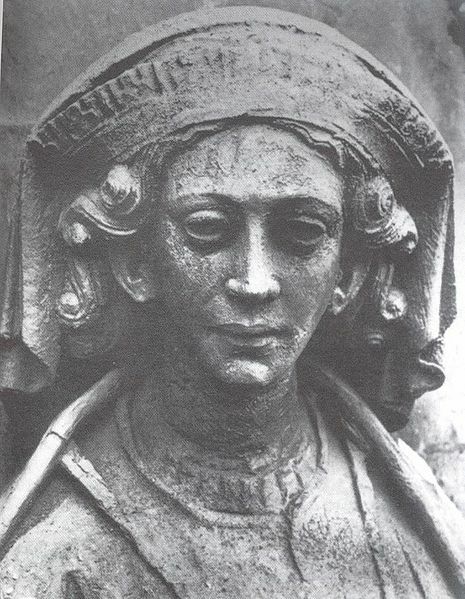 Marguerite was born c. 1279. She was the fourth and last child of King Philip III of France, and the second child by his second wife Marie of Brabant. We know little of her childhood. Her father died when she was three years old and she grew up under the supervision of her mother and her sister-in-law, Joan of Navarre, the wife of her half-brother, King Philip IV. King Edward I of England had been at war with Scotland since 1290 in addition to administering his possession of Gascony in France. In 1296, King Philip IV of France invaded Gascony and Edward was eager to recover it. Due to his military being drained in fighting Scotland, Edward opted for a diplomatic arrangement with the French king over Gascony rather than go to war and lose. Edward may also have been eager for more children as he only had one surviving son by Eleanor. In 1298, Pope Boniface VIII proposed a double marriage of King Edward to Marguerite and of the Prince of Wales to Philip IV’s three year old daughter Isabella. In the spring, Edward sent the Earl of Lincoln to France to discuss the terms of the marriages. The stipulations included the return of Guienne to the English monarchy and a £15,000 payment. Edward agreed to give Marguerite as a dower his first wife’s lands in Ponthieu and Montreuil. In the spring of the following year, after consideration of the provisions by Parliament, Lincoln and Amadeus of Savoy returned to France to perform proxy betrothals. Amadeus reported back to Edward that the teenage Marguerite was the embodiment of the qualities required for a royal marriage such as beauty, piety and virtue. The marriage of the Prince and Isabella would happen at a later date when the children were of canonical age. Marguerite came to England and an opulent wedding took place at Canterbury in September of 1299. Marguerite wore a crown during the wedding and on significant occasions but she was never anointed as queen. She did use the royal title in her letters and documents. She was given all the financial perquisites of her estate along with the dower lands of Queen Eleanor, an enormous endowment. Marguerite quickly became pregnant and Edward went off to campaign in Scotland. After several months, Marguerite decided to join her husband, much to his delight. Her behavior reminded him of his beloved wife Eleanor who constantly travelled with him. While Marguerite didn’t travel with Edward as much as Eleanor did, the chroniclers remark on his great love for her. His letters show he paid great attention to her welfare and that of their children. Less than a year after her marriage, on June 1, 1300, she gave birth to a son named Thomas after Thomas Becket, the martyred Archbishop of Canterbury to whom she had prayed during her pregnancy. It was noted that Margaret was hunting on horseback when her labor pains started. She gave birth to another son Edmund on August 1, 1301 at Woodstock. 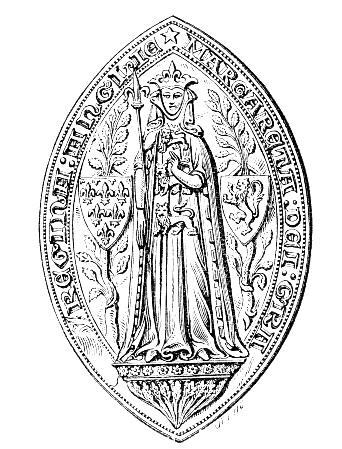 Her daughter Eleanor, named after Edward’s first wife, was born at Winchester on May 6, 1306. The child died in 1310. Edward and Marguerite both exhibited great interest in their children. An elaborate household was established and staffed by fifty to seventy people. They were given a strict religious education and offerings were made in their names at Easter to the poor of clothes, shoes and money. Like their parents, the boys liked to play chess and other games. They were taught horseback riding. Marguerite hired musicians to play for the boys. They received visitors and enjoyed the company of their half sister Mary who had become a nun and their grandmother, Queen Eleanor of Provence. When Marguerite was away from her sons on campaign with Edward, she followed the progress of her children, receiving reports on their diet and overseeing the tailor who made their clothes. She seems to have had a very warm, comfortable relationship with her children which contributed to the happiness of her marriage. Edward was very satisfied with his life with Marguerite as he remained faithful to her. Marguerite was very concerned about her appearance and wanted to be as well-dressed and regal as possible. This sometimes led her to run up debts. Edward provided funds to pay her debts. He was very concerned about her health, keeping in touch with her doctor when she had the measles and recommending bloodletting. Marguerite was on friendly terms with Edward’s daughters by Eleanor. She was very fond of the Prince of Wales and he once gave her a gift of a ruby and gold ring. In 1305 she was instrumental in reconciling the king to the Prince of Wales and calming her husband’s wrath. She also rescued many of the Prince’s friends. Her appearance at state occasions is only noted a few times, such as the Feast of the Swans in 1306 and a commemorative mass for Eleanor of Castile in 1307. In 1301, Edward trusted Marguerite enough to name her in determining if his designated agents had the proper credentials to negotiate a truce with the Scots. Marguerite gained a reputation as an intercessor and mediator between her husband and his subjects. This is a standard role for a medieval queen but she seems to have been very good at it. Many who were subject to the king’s anger were rescued from more severe punishment due to her influence. Documents state: “Pardoned solely on the intercession of our dearest consort, queen Margaret of England”. Marguerite greatly favored the Franciscan order and was the benefactress of a new foundation at Newgate. When her sister Blanche died in 1305, to please Marguerite Edward ordered the entire court to go into mourning. In 1307, Marguerite accompanied Edward on campaign to Scotland but Edward died on July 7 at Burgh by Sands. Marguerite must have been crushed. She was only twenty-eight but she never married again, allegedly stating: “…when Edward died, all men died for me”. Marguerite commissioned a Latin eulogy of her husband that was written by her chaplain John London. She attended the wedding of the new king Edward II to her half-niece Isabella in 1308. After the coronation of Queen Isabella, Marguerite retired to one of her dower houses, Marlborough Castle. She remained in touch with her brother in France and with Isabella. She witnessed the birth of the future King Edward III in November of 1312. Little is heard of her until her death on February 14, 1318 at Marlborough. Her body was dressed in a Franciscan habit and buried at Christ Church Greyfriars in London, the foundation of which she had generously endowed. She had paid for a superbly carved tomb which was sold by Sir Martin Bowes about 1550 when the priory became a parish church. She is acclaimed by English writers for her beauty, goodness and morals. Thank you for this information. Marguerite of France was my 21st great-grandmother on my mother’s side. Eleanor of Castile was my 22nd great-grandmother on my father’s side. I am very interested in learning about my ancestors. An informative and enjoyable read. I am from an old family; Fosseneuve (maternal – descendants of Mathieu Le Neuf, m 1600 to Jeanne LeMarchand Caen Normandie ) who’s descendants ended up in the bush of northern Saskatchewan, Canada. Fosseneuves seem to be derived from the Fossa Nova (family name) in Italy somewhere. In your readings and research have you come across these names? Your writing warms the heart. I haven’t come across these name Doug. Dear Susan, greetings from Chile. I greatly enjoyed your works and i thank you so much for the chance that you give us to all lovers of Middle Ages and History. About Marguerite i would have to know why she died so young? I think that her early demise contribute to the fall of poor Edward II…surely she would have acted as an Egeria for him..excuse if i have errors in my grammar..saludos! Saludos Luis! Gracias for your kind words and your English is fine. Marguerite is an intriguing character. She died at the age of 39 which is moderately old for a medieval woman. Edward II was 23 when he ascended the throne of England, well beyond the legal age necessary. The laws of England would not allow Marguerite to be regent to her stepson for various reasons. However, she could have acted as an unofficial councilor for him. You make an interesting point Luis.